This avocado tuna salad is super fast and easy to mix up and is perfect on a sandwich for lunch or scooped up with veggies or crackers for a healthy snack! I just may have found my new favourite lunch. Avocado tuna salad. It’s a thing. Or maybe everyone else has been making this for years? I don’t know. What I do know is that I mixed this together on a whim a little while ago thinking that avocado in anything can’t be a bad thing. I was not wrong. It’s not a bad thing. Avocado in tuna salad is completely amazing. Again, did everyone else already know this? Whatever, I’ll just pretend it’s completely original and no one else has ever done it before, because, well…I never have. So I’m sure a few other people out there never have either. And you most definitely should. Seriously amazing. I don’t think that I am ever going to want to make tuna salad the normal way again. Avocado and plain Greek yogurt are so good with the tuna that I can’t see myself wanting to make it less healthy by using mayo instead. Except…I will say that we put some of this on jalapeño cheddar bagels and while still good, I enjoyed it much more scooped up on crackers. I think that there were just too many flavours going on with the jalapeño and cheddar and avocado and tuna and lime. But on some multigrain crackers? Amazing. Also….I just realized that I’m throwing yet another recipe involving lime at you today. Which I promised I wouldn’t do. But I literally just realized it, and my photos are all edited and stuff, soooo what can you do? Besides, everyone needed this avocado tuna salad in their lives sooner rather than later. And you all love lime just as much as I do right? If not, well, I will have something sweeter coming later this week to break the endless line of lime filled recipes. Promise. For today though, you should definitely whip up this avocado tuna salad for lunch. Fast, easy, healthy and delicious. Doesn’t get any better than that! Place all the ingredients in a small bowl and mix thoroughly to combine. Serve with crackers and veggies for dipping, or in a sandwich or pita. Tuna salad keeps well in a sealed container in the fridge for 3-4 days. I have also made this avocado tuna salad without the pesto when I didn’t have any, using 1 large clove of garlic (minced) and 2-3 tablespoons of chopped cilantro to replace it. It tastes a bit more guacamole-like when made with the garlic and cilantro, but is equally tasty! OMG!!! So good and easy to make!! I will definitely make again! This is a great idea. I used red pepper Greek yogurt. I also had jarred cilantro/parsley chimichurri so I used that instead of pesto. So good as a sandwich filling and on tortilla chips. Red pepper Greek yogurt sounds fantastic! I'll have to try that next time! I love the idea of adding avocados in this!! could i use regular plain yogurt instead of plain greek yogurt? I haven't tried, but you probably could. Regular yogurt is a lot thinner though, so the texture would change a bit. I think it would still work though. Let me know if you try it out! Avocado is just the best, isn't it?? I love that you used pesto too! That must give it so much flavor! Avocado is definitely the best. I can't believe I didn't think I liked it for so many years, what a waste! Pesto was totally a random decision too, it was there so I threw it in. But it was really good in it! Thanks Ashley! I could happily eat tuna salad for every meal. And I love that you added pesto to yours! This looks like such a fun way to eat tuna salad! I love subbing avocado for mayo, so yummy! It's the first time I've tried subbing avocado for mayo, but I love it! I'll be trying it in everything now! Thanks Denise! I adore avocado in pretty much anything....in tuna salad sounds perfect! Me too, avocado makes everything better! Thanks Cathy! Definitely my kind of salad! Looks amazing! Will make it soon! I love avocado in anything and everything! I bet this tasted delicious! 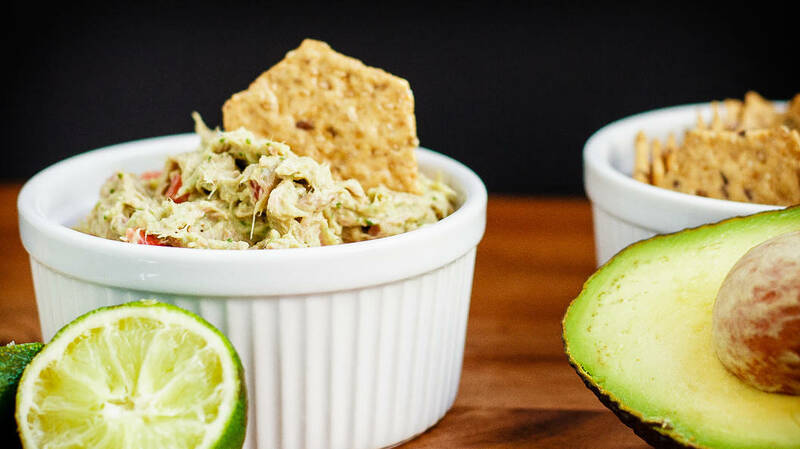 I've made avocado chicken salad before, but never tuna salad! Looks so good! Ooh, avocado chicken salad definitely needs to be made here now that you've put that idea in my head! I've never made that, but I will be soon! Thanks Christin! 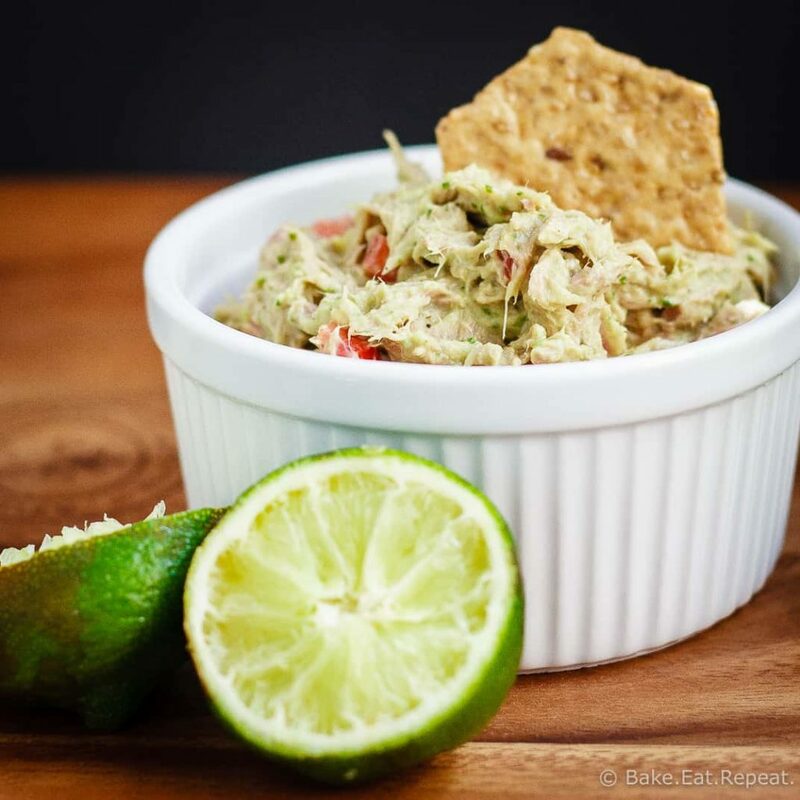 I love that you added avocado and lime to this tuna salad! Such a great idea and sounds so delicious! This tuna salad is calling my name! I love adding avocado to just about everything, so this sounds perfect. What a great summer meal! Haha, no apologies necessary! Love the lime! Me too. Clearly! Thanks Ashley! I truly believe avocado makes anything better, including desserts! Love this combo! Avocado DOES make everything better, I completely agree! Thanks Laura! Love how you made a dip/spread out of this. People will love it! I am really loving the sound of this avocado tuna salad! It would make a great summer lunch. Pinning! My kids love seafood too, but for some reason won't touch tuna - I don't understand it at all. That's the one fish most kids like! Oh well, they won't eat avocado either so what do they know?! :) Hope she likes it! Thanks Kacey! Haha yay for more lime recipes! 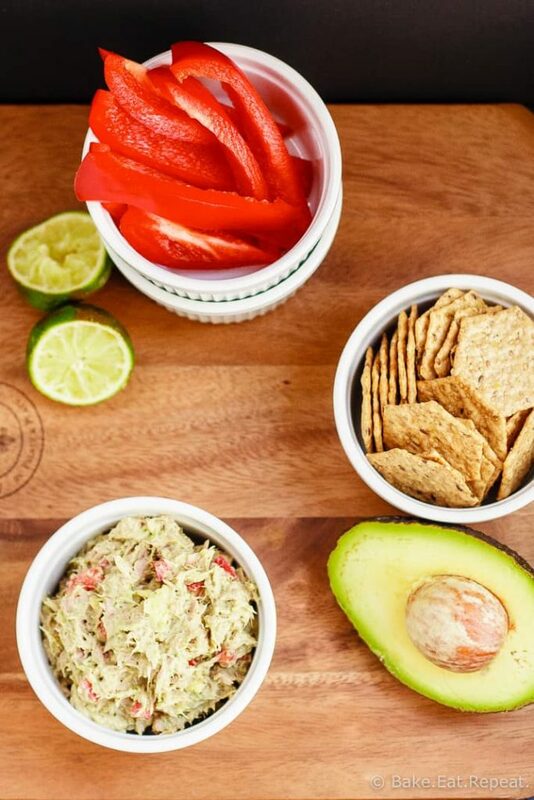 Ok, so I haven't had tuna salad in so long (I think I wore it out as a kid), but I'm definitely feeling this recipe with avocado and red pepper in it - YUM! Can't wait to try this one! Funny how that happens isn't it? You eat something incessantly and then don't have it forever. I do that all the time. This wasn't like the typical tuna salad full of mayo though so it was a really nice change. I loved it! Thanks Heather!